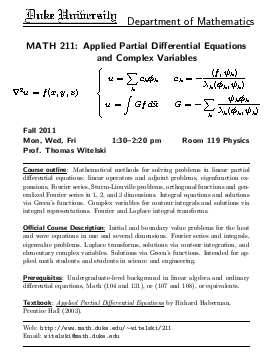 Mathematical methods for solving problems in linear partial differential equations: linear operators and adjoint problems, eigenfunction expansions, Fourier series, Sturm-Liouville problems, orthogonal functions and generalized Fourier series. Solutions via Green's functions. Complex variables for contour integrals and solutions via integral representations. Integral transforms: Fourier and Laplace transforms. Background in linear algebra and ordinary differential equations: [Math 104 and 131], or [Math 107 and 108], or equivalents. Tuesdays, 11:00am-2:00pm, Room 295 Physics Building, or by email request for an appointment for other times. Test 1: Weds, Oct 5, in class -- Solution of inhomogeneous ODE BVP via eigenfunction expansions. Fourier series. Adjoint eigenvalue problems. Sturm-Liouville problems. Integral equations: eigenvalue and inhomogeneous problems. The Fredholm alternative theorem for existence/uniqueness/non-existence. Optional review session: -- No new material will be covered. Questions will be answered and examples worked out. Feel free to come to all/any-part-of the review sesssion block time. Test 2: Weds, Nov 9 -- Green's functions for ODE BVPs (9.3), separation of variables and eigenfunction expansions for PDEs (2.3, 2.4, 8.2-8.4, 8.6), Helmholtz equations, Bessel functions, multi-dimensional problems (2.5, 7.2--7.10), material covered on Homeworks 5-8, Lectures 11-26. Optional review session: Sunday, Nov 6, 4-6pm, Room 119 Physics -- No new material will be covered. Questions will be answered and examples worked out. Feel free to come to all/any-part-of the review sesssion block time. Test 3: Weds, Dec 7 -- Complex Contour integration, parametrization, complex analytic functions, path independence, Cauchy's theorem, Cauchy's integral formula, residues, log branch cuts, evaluation of real integrals, Jordan curve lemma. Material from Homeworks 9, 10 and all lectures on complex variables. Problems accessing the sheets? Local access from *.duke.edu computers or try Duke OIT VPN (Start VPN @ portal.duke.edu with Dept:Library Resources) or email me.